The easiest way to display a toolbar is to right-click any visible toolbar. This displays the list of all your toolbars, as you see here on the right. Just pick the one you want to make it visible. However, certain custom toolbars, and the Express Toolbars aren’t listed. To find them, right-click any blank (gray) area next to a toolbar. Click ACAD to find the same toolbars you’d get by right-clicking a displayed toolbar. An alternative is to choose View> Toolbars. Starting with AutoCAD 2006, this opens the Customize User Interface (CUI) dialog box. As you can see, the On By Default value is Hide. Click to reveal a drop-down arrow, and choose Show to display that toolbar by default. An excellent way to control the display of toolbars is with workspaces. You can create a workspace that displays any set of menus, toolbars, and palettes (called dockable windows in the CUI dialog box). You can do this in 2 ways. Display the toolbars that you want. In the Workspaces toolbar, choose Save Current As from the drop-down list. Enter a name and choose Save. Now, you can choose that workspace any time you want it from the Workspace toolbar (assuming you can find the Workspace toolbar!). You can also create a workspace in the CUI dialog box. Right-click the Workspaces node and choose New> Workspace. Then type the name of the workspace. Click the Customize Workspace button. What this does is add a checkbox next to all the items on the left. Then you check what you want and uncheck what you don’t want. For each item, you can specify its properties, such as Docked or Floating. Finally, click Done. Toolbars can sometimes get “lost” due to a change in screen resolution. If you recently changed the resolution of your screen, try a higher resolution, which will show more items at the edge. You can protect toolbars from moving by locking their position. Right-click any toolbar and choose Lock Location. Then choose Floating Toolbars to lock those that aren’t docked, Docked Toolbars, or All. Have you tried the technique described in the tip? i have lost all of my toolbars. i mean all of them. i don’t even have the file dropdown list. i used the right click to go to options, but when i right click now, there is nothing. there are no toolbars or dropdown list at all. i went to look at cui and the default dropdown lists are there but it has no properites to it. i don’t know what i did if i did anything. Try the MENULOAD command to reload the menu. Also, try changing the workspace to see if it’s just a problem with the workspace. Just some suggestions…. thanks a lot….MENULOAD solved my issue. Then when I go to ‘File’and drop down menu to ‘Close’ the drawing it asks whether I wish to save the drawing file. Is there a patch to rectify this problem on Lt 2010? I can’t show Auto CAD 2011 menu bar. How I show it .please inform me. Two ways, that I can think of. Choose Classic as the workspace. Or, to keep both the menus and the ribbon, set the menubar system variable to 1. Type menubar on the command line and press Enter. Then type 1 and press Enter. My autocad2009 does’t have any tool bar appeard with workspace.Is there any way to get the tool bars in 2009? or I have to run any add-ons..Please let me know your reply. I don’t remember that far back. Try choosing the Classic workspace. What do you see? Or from the menu, try View>Toolbars and choose one. Great post thanks. Is there a way to lock the menubar in Autocad 2012? I use it often but have to reload it everytime I open Autocad which is a pain! Try resetting your profile by using tool menu. then go to options. there is a reset button in the profile tab. i have a hge assignment due tomorrow and i have wasted two hours so far trying to figure it out and nothing works. Have you tried MENULOAD, reloading the acad menu? We use some ancient software called Mechanical Desktop 2004, note the sarcasm, lol! Anyway, our one employee boots up AutoCAD this morning the Express menu is gone, so we type in “EXPRESSTOOLS” at the command prompt and it brings it back, but once he leaves AutoCAD and boots up again, it’s gone every time. It’s not an option when you type in “MENULOAD”, but is there after typing “EXPRESSTOOLS” at the command prompt. When you go to search for a file in menuload, it’s looking for and “mnc” file which I cannot find. Any clues? Hard to know what might have happened and as you obviously realize, 2004 is old. I don’t remember much about it. See if you can find an .mnu file, which is the source code for the .mnc file. Thanks for this post. I hope you can help me. In my dynamic block editor, my drop down menu for visibility states is missing (the buttons you push to show all visibility states at once, etc.). I have tried everything to get it to come back up. ordinarily a small menu appears at this point giving you a series of options “Mtext, none etc” however this menu has now disappeared. It sounds as if the command was redefined. There are other leader-related commands, such as QLEADER and MLEADER. Try those. MAM , i wanted to learn more about auto cad . you send me more lesson of auto cad . God bless you so much . Same thing with those commands, another instance is for the “UCS, face” command, once the face is selected the menu used to prompt you for “Accept, X-flip, Y-flip..etc” but this now only appear at the command prompt. “Dynmode” was set to , how that happened I do not know but at least I’ve resolved it now. using Autocad 2010 architecture. User wants setup as autocad classic workspace. option is not available is workspace settings. user wants classic control the buttons gave him, but only tabs command structure available. how can we change to classic workspace? All I have is in this blog. Good luck! I using autocad 2009. And I have loosing my tool bar like tool bar does’t appeared on the screen. Please give me your suggest to me as possible as. I don’t have any ideas except for the 4 that are in the blog post. Have you tried them all? By default, toolbars don’t show, just the ribbon shows. Have you tried the 4 methods in the tip? A coworker who is using LT 2008 today has lost all toolbars and most of the menus. We have tried reloading the acadlt.cui file but this had no effect. When I opened the CUI there were no toolbars or menus to select, when you click on the +menus or toolbars there is no list that opens up. It’s as they have been deleted from the program I found this post and got as far as “On by Default value is Hide.” where exactly is this option? I can’t see it in your photo. Can you please explain method #3 because I have the exact same window in front of me, as it’s shown here, and there is no “hide” option, no drop-down which has a “show” option. I’ve clicked everything, the only options are “new”, “find” and “replace”, or the help file. My toolbars all disappeared over the weekend mysteriously, despite having them locked and saved as custom workspace which is set to not save changes. Like a double safety. But somehow it changed by itself AND saved the changes. Sorry ignore last, I’ve found it. They certainly make you work for it! Method 3 didn’t work for me, after applying changes from “hide” to “show”, none of the toolbars re-appeared. I now think they might be there, but dragged somewhere far off screen. I haven’t changed resolution. Perhaps reload the menu? Try the MENULOAD command. Are you using a release that has a ribbon? Can you get that to show? I have recently been upgraded to LT 2013, and I created a new workspace with heavily modified ribbons, panels and toolbars etc. The only problem is… my PC has since been upgraded and AutoCAD re-installed but i cannot find the file for my saved workspace? I would prefer to transfer it instead of spending lots of time re-modifying my ribbons! Any ideas what the filename or extension would be and where it would be saved? My toolbars are visible in acad7, but the icons are not? I can select them and they do work. Just can’t see them. Can you advise? I’m happy to save a life or two! Can any one help me please???? My issue is that UCS Face does not work in ACA 2013 as it did in ACA 2010/11/12. Can any one describe me……. Need to know that when ever i work in autocad sometimes when i need to open a file from open command option suddenly my command bar ask me that enter the file name? What is solution for it? Perhaps change the FILEDIA system variable’s value to ON if it’s off. how can i reload the commads for a drawing that z already saved? 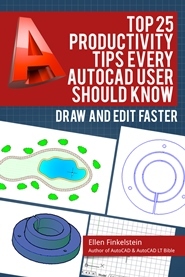 The easiest way is to choose AutoCAD Classic from the Workspace drop-down list at the upper-left corner of the screen. Na heel wat projecten heb ik van een goeie ex-collega Johan tijdens het tekenen van lucht-kanalen destijds met nordined tijdens lastige hoeken van de bouwkundige onderlegger een handige commando waarbij je die intypt en op de desbetreffende Bouwkundige Lijn je assenkruis stelsel de hoek overneemt en zo handig je kanalen of leidingen kan neerzetten.Se vraag is dan, komt het jou bekend voor,weet je toevallig hoe je die commando binnen de autocad-2011/2013 kan activeren. From Google Translate: After a lot of projects I have a good ex-colleague Johan while drawing air channels then with Nordined during awkward corners of the building pad handy command that you who typed and the corresponding Building Line your axes system the angle takes over and so convenient your channels or ducts may neerzetten.Se question is, is it known to you, you happen to know how you can activate commands within the autocad-2011/2013. Hi, all the above didn’t work for me until I found it 2 simple steps to recover the toolbars that just disappeared for no reason. Typing ‘menu’ and choosing ‘acad’ is the only thing that worked for me too. 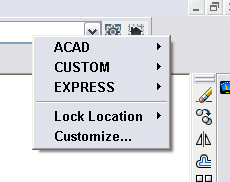 I don’t have ANY common toolbars in ACAD CLASSIC in AutoCAD LT 2012, just a SEARCH AUTDESK SEEK. Right-Click lacks AutoCAD. Happening on 3 computers out of a school lab. Not showing up in DRAFTING & ANNOTATION, either. Any thoughts? And am seeing AUTOCADWS. No DRAW, MOD, DIMEN, OBJ SNAP. Need for kids. Not ready for Ribbon. Try MENULOAD and see if loading the ACAD menu helps. MENULAOD is great , now. i can see my toolbar….. I have accidentally dragged a toolbar partly off the screen. I now can’t drag it back. I’ve tried turning it off and on again but it goes back to the same position. How can I see beyond the screen to drag it back? 1.) At the AutoCAD command line type “CUI”. This opens the “Custom User Interface” dialog. 2.) Select your current workspace on the tree in “Customization in All Files” window, located in the upper left corner of the customize tab. 3.) 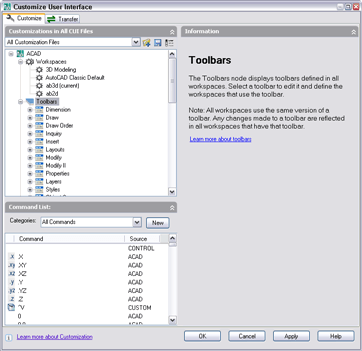 In the “Workspace Contents” Window (upper right), expand the “Toolbars” branch. 4.) Find the lost toolbar name on the list, select it and edit the “Default X Location” and/or “Default Y Location” in “Properites” window (lower right). You may need to set the “Orientation” value for the toolbar to “Floating” before you can edit the coordinate fields. 5.) Select the “Apply” button at the bottom of the dialog to invoke the new toolbar location. Continue adjusting the coordinates and applying until the toolbar is back on screen. Once the toolbar shows on screen, close the CUI dialog and move the toolbar back to it’s happy home. In AutoCAD 2014 I am no longer able to see the names of my toolbars when they are set to floating. In AutoCAD 2008 all of my toolbars were able to show their names when set to floating. I am in classic mode in AutoCAD2014. Is there any way to display the names in floating toolbars again? Thanks.3rd method works for me. Thank you thank you……………… THE MENULOAD WORKED…. DO THE MENULOAD AND THEN LOAD ACAD. Thanks Filedia seems to turn off if a drawing closes unexpectedly. frustrating. when i have done some extra zoom in a object, i am facing a problem like , the cursor is not moving properly, pls solve my problem. I found my answer to the 2008LT no toolbars problem!! Go to Menuload –browse AcadLT–Under Support folder, look for autocadsampleworkspaces. Load it. Thanks Miss Ellen and Everyone. There is no reference to the normal AutoCAD toolbars. I have used all four of your methods above and nothing is found. My workspace is Civil 3D. Very frustrating. Thanks. Mohammed, can you be more specific? Not sure what problem you’re having. I type CUILOAD at the command prompt, the “Load/Unload Customizations” dialog box shows up and I go to the file location shown above – the file “acadlt.cuix” is still there…. what’s going on? I keep reinstalling the file, but every I turn off the computer, the same thing happens. Ellen are you still helping? I have tried all 4 of the above methods but i still have no toolbars. If i go to the customize user interface and click tools nothing happens, no expaning of folder, no new lidt of tool bars, NOTHING. The only tool bars i have on display are the adobe ones of which there are three. im a novice but any help would be appriciated. i want to remove drawing to another autocadd,then i select drawing i right click but does’t show anything..
*should i install autocadd again or have another solution. sorry my English not very well..
how can i bring back my toolbar on my work space. i don’t know if i hit some keys that remove my toolbar. i used 2007autocad, then if i open an old file: image is there, but there is no toolbar like it displayed before. and if i try to print my work, using “ctrl. P” it doesn’t work. hope u can help me.. I do try “menulaod” & “cui” but nothings happen. can you please explain how to resize a toolbar. I have created a new deployment of AutoCAD Mechanical 2014. When users install, the ribbon is empty. I know I can have them try the tips above. Question is how to get the deployment right in the first place. I find no place to set default workspace or anyother method to retain. BTW it worked but now is does not. Any ideas? I want display “specific next point” when i drowing ,but i dont see this feature .how can start this in Mechanical desktop 2009? What are you trying to draw? A line? You should be able to just type the x,y coordinates of the next point. In Autocadd 2015,how set the tool bars?? In my screen I don’t have even a single toolbar. MenuLoad just saved me. IT reloaded AutoCad to my computer and the menus did not show up at all. I could not find anyone who knew what to do-so frustrating. Thank you so much! My Auto Cad 2008 just open without menu or task bar..only file, view, window, and help. i lost my breakline command. it is not in working. i amusing autocad 2013. when i write bk for breaklineits comes as a unknown command. what will i do o reload it? i have problem when i open Auto cad drawing then help menu automatically open. i want don’t want to help menu open every time. It looks like the shorthand version of the BREAK command is BR, not BK. you are right.I also used BR for break line but it did not work. i found this problem after the installation of CAD-2016. now i have both version in progress, the problem i am facing is only in CAD 2013, not in CAD 2016. break line works in 2016 properly but failed in 2013. if any body have a idea how it will solved plz tell me. thank. Ellen, where are you? please solve my problem, this is my 3rd email. tell me please how i can get rid to this problem? ellen, ellen , ellen where are you? PEHLIVAN!! I THINK YOU DONT UNDERSTAND MY PROBLEM. I USED BR, BK AND ALL OTHER OPTIONS BUT NO ONE WORKS. This site is very helpful & easy tips. I like it. I using autocad 2014. And I have loosing my menu bar,only file, window and help bar appeared on the screen. Please give me your suggest to me as possible as to get back other menus.please suggest. Thanks for making this blog available. Nothing I have tried has worked for my user. I can use MENULOAD to restore previously locked toolbars in a new session, but they are gone until I unload and reload when opening the next session. I don’t see an opening lsp file for any of the users, so I expect the display state to be loaded some other way with ACAD 2013. This is the first complaint of this type that I can remember seeing in this version. 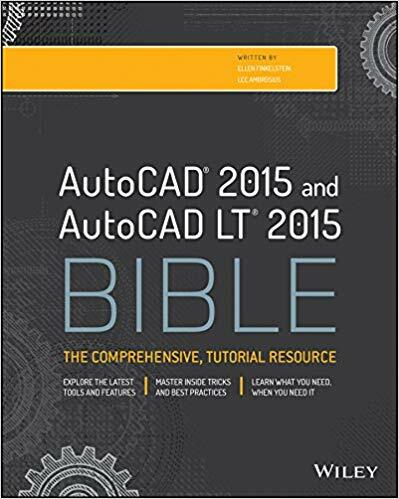 Hi, I downloaded autocad 2016, Educational version. But My home bar is Missing, I did a “resetting to default” and still no result. and if I follow the instructions to open the template ‘no template – metric’, I can’t find it because there is no arrow next to open; I’m using a Mac pro. What is the name of the toolbar on the left which has shapes? I have lost my toolbars only when I am in 3D modeling workspace how can I solve this problem? Thanks it solved my problem too??? THANKS, AURORA! This worked for me after losing the menu at the top of my screen! HEEELP!!! I have just installed 2019 Civil 3D, I use 2 monitors (main screen for map view and side screen for floating toolbars and windows), and after several hours of resetting my workspaces I am having a couple of recurring issues. 1. Every time I update my Quick Access Toolbar, my ‘joined’ Floating toolbars change orientation (i.e. landscape to portrait) AND they change positions when toggled back to landscape… and YES the individual toolbars are LOCKED. 2. If I undock the ribbon (which I prefer to have on my side screen to give more space for map view), my locked toolbars completely disappear (but windows remain)!! Please let me know what I’m missing to keep my floating toolbars set the way I’ve set them. You might want to find out if the Express Tools option was checked during installation of the software. It has to be installed from the 2007 product CD under custom installation. CUI (custom user interface) is just access to the screen menu, workspaces option that allows you to display toolbars and menus that are ALREADY loaded. Unfortunately CUI and workspaces do not install anything afterwards.